Sometimes you need to remember what is real. Is it the prevailing tide of opinion in all its digital cacophony, of feeds and tweets and posts and oh so shareable commentary? Closed minded fools masquerading as open minded elite, intellectually dishonest assuming the cleverest of ground, storytellers spinning their own fairy-tales in self-congratulatory wonder. For a moment or more I despaired. Then I attended a Christian wedding with my happily-married wife of 32 years in a church that continues vibrant Christian worship more than 100 years after it was built. The stained glass reminded me of a good shepherd and I recalled being at the Christian wedding of the parents of today’s bride. The gathering was ablaze with faith. There was humour and poetry and music and beauty and family and community and generations but must dazzling to me, faith. The pall of the morning’s mourning was replaced by a mantle of praise and a bringing to life of what Paul described as mystery – how the of the union of a man and woman somehow spiritually, fundamentally, intrinsically pictures God’s love for his called-out-to-gather people. It was the realest thing by far. And then they kissed… twice. Before the minister had time to invite the anticipated physical display of affection, the young groom leapt forward and planted a long kiss on his smiling bride, stepped back, and then did it again, both all red faced innocence and joy. When today’s posturing about what things are important is superseded by tomorrow’s, those things that are eternal, which have never failed, have never looked like waning, will continue on with little concern as to whether anyone else notices or not. 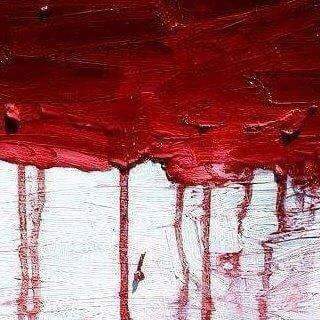 A section of one of Myuran Sukumaran’s final paintings showing the Indonesian flag dripping blood. Surrounded by scared politicians, corrupt officials, chaotic processes, frenzied monetized media, public outpourings of hate through to mercy, courageous grieving families and the rest of us who can only really guess at how this ever came to be – a Pastor and an Artist, loved sons both – have ‘died well’ alongside fellow prisoners they had comforted. There is a miracle here, but for now sorrow and grief. Anger will bloom in many and there will be a turning on one another, personally, nationally. But we who know the Cross know ‘in the world you will have trouble but I have defeated the world’ and ‘death where is your sting’. I refuse to take my cue from rampant media and jostling politicians but from the Rock of salvation on which these two men had learned to trust. Even as this unjust tragedy moves past us, carried away by an insatiable news cycle, other horrors will rise up to replace it. And while we are often spectators, we can pray for the participants and commit them to ‘the God who is there’. Each time we act justly and mercifully and choose to continue walking with God in the ‘trouble’ we ourselves must face, we make a difference that no headline will report. 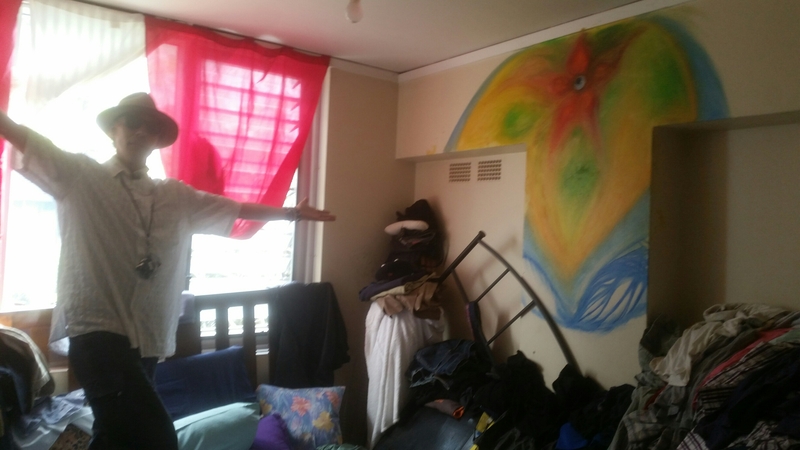 In the shadow of a Sydney public housing tower, light and love break out in a post-modern expression of ancient truth. The purely secular event, addressed at times by politicians of the left, fulfilled quite superbly the principle of the good Samaritan. Christians came, not with authority or position, but with that greatest of all influences – genuine friendship. Amazing Grace was sung over the event with more power and pathos than might be found in many church services – not arranged by any human plan but because the request for ‘one more song’ drew it from the heart of the Aboriginal singer who stunned us with her voice and her spirit. A once-was-a-pastor wandered around, sharing conversation, bridging gaps and encouraging residents and the young workers who gave up their Sunday to serve the community. He promised his chocolate wheel ticket, if it won, to a woman who has little but loyalty and dignity. It did win and she promptly tried to give the prize back even though it would likely be the only thing of beauty she would receive for a long time. Old friendships were renewed and far from confessional or altar, stories were shared freely of recovery and new hope amidst old battles. Then, as if to show that God was pleased and would not be left out, was not afraid to be included, the microphone was handed to a young mother who was there with a small child, there because of her heart that is soft towards those who have had the hardest of lives. She too had a winning ticket but, before she could receive her prize, was required to answer a question in front of the entire gathering. ‘What is love?’ asked the MC. And what a surprising question this was. The young woman, her daughter playing at her feet, searched for an answer that was both true and respectful of the moment. All eyes were on her. ‘Love is many things’ she said, tentatively. But then, finding courage. And in that moment we all knew it was true, and quietly, without preaching, many were encouraged to remember the Source of love. Joel Edwards of Micah Challenge speaks of the church no longer holding institutional or official power but needing to find grassroots legitimacy through its acts of justice, mercy and humility. I see evidence of this often. I saw it in action in the shadows of a public housing tower. 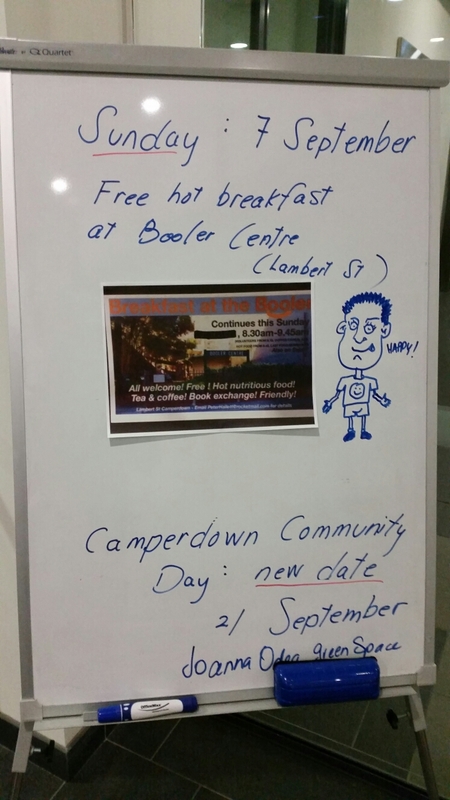 A community breakfast in this neighbourhood will continue at the Booler Centre on the first Sunday of each month, 8.30am to 9.45am. George: Did I tell you the one about the man who went into the burger shop? Me: No, I don’t think so, fire away. Those of us who heard the joke were left scratching our heads but the playful grin on George’s face was worth a thousand jokes and I had to laugh. Told by a man who frequents free meals around the city, it’s a reminder to the comfortable classes in this blessed land that we are privileged and well-off and that by world standards we have little to worry about, including starvation. But maybe it also reminds us that despite our taking for granted the abundant provision we enjoy, there are all around us people who are starving. And it is with these friends and others I will surround myself on Father’s Day morning because if a father cannot demonstrate compassion then what good is he to his children. I may have to listen to more of George’s jokes, or worse – the despairing tales of men who never see their children or women who never knew a decent man. But maybe I can be something of what they have lost by the sharing of my life. Photo: The staff of a local community project, having recognised something of value in our little breakfast, created this ‘billboard’ for local people. It warmed my heart when I stumbled upon it. 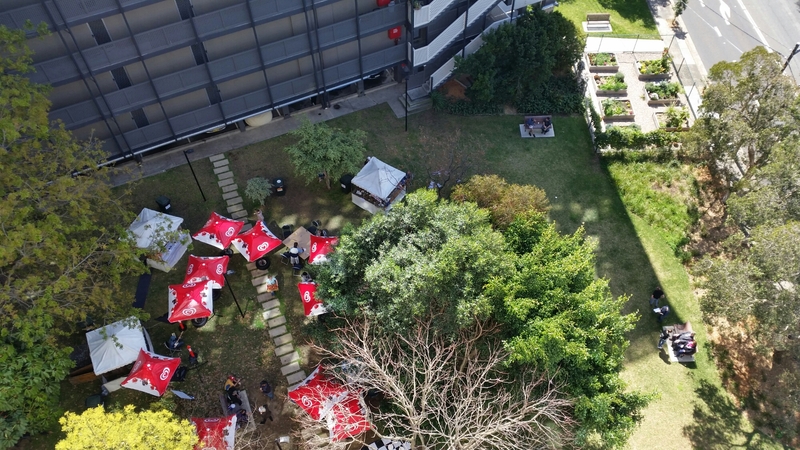 Breakfast at the Booler is on this Sunday from 8.30am and we’ll join in the festival in some way on September 21. But where to go from there?? Calvary and Anzac Cove say, ‘Not my will, lest we forget’. But sometimes by the brave, in loss. And we remember them, more than ever, more than mostMoved and strangely weeping. Not my will, lest we forget. Happy Easter greeting, not returned. Unobtrusive, benign, begrudging, slightly bitter? God, it’s Easter. The core of my being, nothing more or less, forgive me Easter. And what will we wear world, garment of praise, garment of the age? …they divided up his clothes by casting lots. Moses had spent 40 days removed from the normal rhythms of life in the presence of God receiving a blueprint for the future, an agreement for living, a look at how things could be, all written in stone by the finger of God. Then God gives Moses those tablets, bearing the words of the 10 Commandments, even though he knew it was going wildly skewiff on the ground. No doubt God was peeved too but it was Moses, tired and hungry after a 40 day fast and difficult climb, who took the ‘future’ and smashed it in the midst of his community’s messy ‘present’.